After purchasing theatre tickets for the evening, we started out today with The National Gallery. I found that after having visiting the Louvre and Musée d'Orsay it was difficult to be impressed with The National Gallery. They had a number of works by famous artists such Monet, Rembrandt, Van Gogh, and Renoir, but they just weren't of the same caliber as the paintings in Paris. I was, however, particularly fond of Renoir's Boating on the Seine. 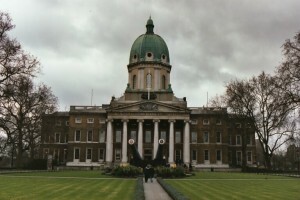 After the National Gallery we went to the Imperial War Museum where I was very impressed. When your first walk into the museum you're immediately greeted with very large instruments of war including tanks, missiles, and aircraft. 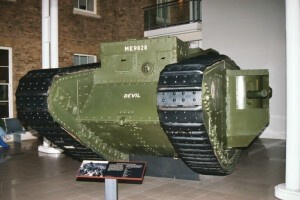 The lower level of the museum had an extensive collection of artifacts and details from both world wars. The collection covered everything from uniforms to weapons to models of the ships and submarines used to propaganda posters to cans of food with labels reminding people to ration. They also had an exhibit that I thought was extremely well done called "The Blitz Experience" where you start off sitting in a London bomb shelter where the walls shake as you hear bombs exploding just outside. It even had an audio recording where you hear people in the shelter talking and worrying about what's going on around them. After the air raid sirens give the all-clear you step out of the shelter to see the devastation wrought upon the city. On the top floor (4th floor) they had an exhibit on crimes against humanity. It had a 30 minute video on genocide and ethnic conflict that looked at some of the common features shared by the horrendous bloodshed in Armenia, Nazi-occupied Europe, Cambodia, East Timor, Bosnia, Rwanda and elsewhere. I originally planned on watching a few minutes of it, but being a student of psychology I found the discussion of how people are able to justify their actions of viciously slaughtering other human beings to be fascinating and ended up watching the whole thing. It shocked me to see how people are able to go into a village, kill everyone, move into their homes, and leave the bodies of their victims lying in the street like yesterdays trash. On the third floor was the Holocaust Exhibition. It was extremely well done and I was very impressed with the way this topic was presented. The exhibit was organized chronologically starting with the political and social problems affecting Germany after WWI. It progressed through Hitler's gradual rise to power and his flawlessly executed strategy of gradually dehumanizing, deporting, and eventually exterminating the Jews. The end of the exhibit had a model of the Auschwitz II-Birkenau concentration camp. It showed how the Nazis kept refining their process of mass extermination, trying to kill the greatest number of people in the shortest amount of time for the lowest cost. It also had photos of the people who ran the concentration camp along with the lies they told friends and relatives of what they did at "The Factory." The exhibit ended with a plaque containing a quote by Edmond Burke 1729-1797, "For evil to triumph it is only necessary for good men to do nothing." I thought this was an appropriate quote not only for the Holocaust, but also for the current conflict in the Middle East. Unfortunately, since we spent so much time in the Holocaust exhibit (I wanted to take my time and get as much out of it as possible) we weren't able to see all the exhibits in the museum. 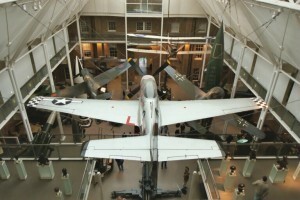 If I visit London again I'll definitely come back to this museum to see the rest. After the museum and a quick dinner (we were running late), Joel and I saw Joseph and the Amazing Technicolor Dreamcoat. Joel hadn't seen it before and after seeing it in Chicago a number of years ago starring Donny Osmond I didn't mind seeing it again. Unfortunately the performance wasn't as good as the production I had seen. I enjoyed it nonetheless.